Did you know that the Arctic Tundra is the world's youngest biome? It was formed 10,000 years ago. Located at latitudes 55° to 70° North, the tundra is a vast and treeless land which covers about 20% of the Earth's surface, circumnavigating the North pole. It is usually very cold, and the land is pretty stark. Almost all tundras are located in the Northern Hemisphere. Small tundra-like areas do exist in Antarctica in the Southern Hemisphere, but because it is much colder than the Arctic, the ground is always covered with snow and ice. Conditions are not right for a true tundra to form. Average annual temperatures are -70°F (-56°C). Tundra comes from the Finnish word "tunturia", which means a barren land. The ground is permanently frozen 10 inches to 3 feet (25 to 100 cm) down so that trees can't grow there. The bare and sometimes rocky ground can only support low growing plants like mosses, heaths, and lichen. In the winter it is cold and dark and in the summer, when the snow and the top layer of permafrost melt, it is very soggy and the tundra is covered with marshes, lakes, bogs and streams that breed thousands of insects and attract many migrating birds. The main seasons are winter and summer. Spring and fall are only short periods between winter and summer. The tundra is the world's coldest and driest biomes. The average annual temperature is -18° F (-28° C). Nights can last for weeks when the sun barely rises during some months in the winter, and the temperature can drop to -94° F (-70° C). During the summer the sun shines almost 24 hours a day, which is why the Arctic is also called the Land of the Midnight Sun. Summer are usually warm. Temperatures can get up to 54° F (12° C), but it can get as cold as 37° F (3° C). Average summer temperatures range from 37° to 60°F (3° to 16°C). The tundra is basically like a desert when it comes to precipitation. Only about 6 - 10 inches of precipitation (mostly snow) fall each year. Below the soil is the tundra's permafrost, a permanently frozen layer of earth. During the short summers the top layer of soil may thaw just long enough to let plants grow and reproduce. Since it can't sink into the ground, water from melting permafrost and snow forms lakes and marshes each summer. There is barely any vegetation in the tundra, only about 1,700 different species, which isn't very much. These are mostly shrubs, sedges, mosses, lichens and grasses. There are about 400 varieties of flowers. The growing season is only about 50 to 60 days long. There are no trees, except for some birches in the lower latitudes. The ground is always frozen beneath the top layer of soil, so trees can't send their roots down. Willows do grow on some parts of the tundra but only as low carpets about 3 inches (8 cm) high. Most plants grow in a dense mat of roots which has developed over thousands of years. The soil is very low in nutrients and minerals, except where animal droppings fertilize the soil. Surprisingly there are animals in the tundra. Although there isn't a lot of biodiversity, only 48 species of land mammals are found on the tundra, there are a lot of each species. These consist of slightly modified shrews, hares, rodents, wolves, foxes, bears and deer. There are huge herds of caribou in North America (known as reindeer in Eurasia) which feed on lichens and plants. 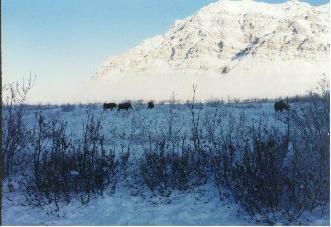 There are also smaller herds of musk-oxen. Wolves, wolverines, arctic foxes, and polar bears are the predators of the tundra. Smaller mammals are snowshoe rabbits and lemmings. There aren't many different species of insects in the tundra, but black flies, deer flies, mosquitoes and "no-see-ums" (tiny biting midges) can make the tundra a miserable place to be in the summer. Mosquitoes can keep themselves from freezing by replacing the water in their bodies with a chemical called glycerol. It works like an antifreeze and allows them to survive under the snow during the winter. The marshy tundra is a great place for migratory birds like the harlequin duck, sandpipers and plovers. The tundra is one of Earth's three major carbon dioxide sinks. A carbon dioxide sink is a biomass which takes in more carbon dioxide than it releases. Carbon dioxide is a greenhouse gas that contributes to global warming. During the short summer tundra's plants take in carbon dioxide, sunlight and water in the process of photosynthesis. Plants normally give off carbon dioxide after they die and decompose. But because of the short, cool summer and freezing winter temperatures, plants can't decompose. Remains of plants thousands of years old have been found in the tundra permafrost. In this way the tundra traps the carbon dioxide and removes it from the atmosphere. Today global warming is melting the permafrost of the tundra and every year several feet of tundra are lost. As the tundra melts, the plant mass decomposes and returns carbon dioxide to the atmosphere. The tundra is a very fragile environment. The extremely cold temperatures makes it a difficult environment to survive in during the winter, and plants and animals have a hard time coping with any extra stresses and disturbances. More people moving to the tundra to work in the mines and oil rigs have created towns and more roads. Some animal's movements to traditional feeding and denning grounds have been disrupted by these obstacles. When they try to pass through a town they are often scared away or shot. With their feeding patterns disrupted, many polar bears have starved. The Alaskan oil pipeline was built across a caribou migration route. In some places the pipeline has been raised above the ground so the caribou can pass under it. Pesticides have been used to control the hordes of insects. Thousands of migrating birds come to the tundra because of the abundant insects. Through the food chain the pesticides reach many of the animals that live on the tundra. Pollution from mining and drilling for oil has polluted the air, lakes and rivers. The land around some nickel mines in Russia has become so polluted that the plants in the surrounding area have died. Footprints and tire tracks can be visible for many years after they were made. When the sun hits the ruts it causes the permafrost to melt. This causes erosion and the ruts get bigger, and eventually the ruts turn into gullies. Tracks made during WW II have grown so large that some of them are now lakes. The tundra is not a cold and useless wasteland. It is a very fragile environment and the plants and animals that have made their home on the tundra biome have made some incredible adaptations to the long, cold winters and the short but abundant summers. They live on a precarious edge and the smallest stresses can bring about their destruction. Kaplan, E. (1996). Biomes of the World: Tundra. Hong Kong: Marshall Cavendish Corporation. "The World's Biomes: Tundra", http://www.latymer-upper.org/geog/sixth/tundra%20the%20not%20do%20barren%20land.htm, (July 2000). Photo Credit: "Interface", http://www.nsbsd.k12.ak.us/PROJECTS/arctic_year/anaktuvuk/interface.htm, (July 2000). *Check out this website for great info on life on the tundra and the people who live there!